Ключи к упражнениям по английскому языку, Федуленкова Т.Н. 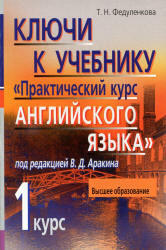 2007, к учебнику Практический курс английского языка 1 курс, Аракин В.Д. 2007. Forty-six plus eighteen is sixty-four. Fifteen minus eight is seven. Eighty minus thirty is fifty. Nine plus eleven is twenty. Four plus forty is forty-four. Ten plus eight is eighteen. Seventy-nine minus fifty is twenty-nine. Ninety-nine plus one is a / one hundred. Thirty divided by five is six. Five multiplied by five is twenty-five. Nine multiplied by nine is eighty-one. Ten divided by two is five. Six multiplied by eight is forty-eight. Six multiplied by six is thirty-six. Twenty-seven divided by three is nine. 1. Take your books out of the bags and put them on the desks. 2. Open you books at page 79 and find Exercise Twenty on it. 3. Go to the blackboard and write Sentence One. 4. Come up nearer to the bookcase, will you? 5. Put your exercise books aside, will you? 6. Read Text 1 on page 83, will you? 7. Will you look at the picture, please? 8. Will you close the window, please? 9. Will you, please, speak louder? 10. Please, prepare you homework in time, will you? Revision Exercises on Tense and Voice 227.